The 3,000-year-old city of Beijing is the capital of China and offers plenty of things to do and must-see places for tourists. The city has witnessed the prosperity and ruin of several dynasties in ancient China. Its imperial past, rich culture and modern conveniences attract numerous tourists from all over the world. For both first-timers and frequent visitors, what are the things you must to do in Beijing and where do you must go? 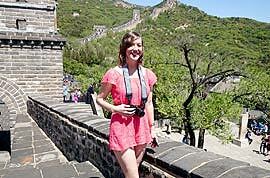 Besides the Great Wall and Peking Duck, are there any other interesting things to do? You do need to check our following list of top 10 things to do in Beijing. As one of “the Seven Wonders of the World”, the Great Wall is indeed number one among the best things to do in Beijing in one day. Many people know the famous saying “One who fails to reach the Great Wall is not a hero!” which was put forward by Chairman Mao. The Great Wall stretches thousands of miles from east to west and it was built over 2,000 years. The Badaling and Mutianyu Great Wall in Beijing are the most famous and best preserved sections. Badaling is so popular that surely it will be crowded particularly during holiday periods. Mutianyu provides a good option to enjoy the majestic grace of the wall. The Forbidden City, also known as the Palace Museum, was the imperial palaces for 24 emperors in the Ming and Qing Dynasties (1368 - 1911). It is the most complete and largest wooden structure complex in China and even in the world. One sixth of all of the cultural relics in China are in the Palace Museum making it one of the top 10 things to do in Beijing. If the weather permits, you can enjoy a panoramic view of the Forbidden City from Jingshan Park which is located near the north gate of the Palace Museum. Tiananmen Square, a symbol of Beijing, is super large, and stands on the central axis of the city. The square has witnessed a lot of important events of China. In fact, it is where the Chairman Mao proclaimed the founding of the People’s Republic of China. Around Tiananmen Square, you can see Monument to the People's Heroes, the National Museum of China, and the Chairman Mao Memorial Hall which contains the remains of the great leader. A lot of local people attend the daily Flag-Raising Ceremony on the square and it is one of the must-do things for Chinese tourists. A visit here in the early morning would be a pretty unique experience. The Summer Palace served as a resort for the imperial family in the Qing Dynasty (1644 - 1911). Situated on Kunming Lake and Longevity Hill, the park was constructed in Southern classical garden style and is the best-preserved royal garden in China. Here you can experience the unique design of ancient Chinese buildings and enjoy the fascinating landscape. What’s more, if the weather permits, you can take a boat trip on Kunming Lake and that will be a fun thing to do in Beijing in spring. Tasting Roast Duck, a typical local food, is no doubt one of the top 10 things to do in Beijing. The first premier of China, Premier Zhou received the foreign guests with this delicious food at least 27 times. In fact, there are two kinds of Peking Duck Menlu Roasted Duck made in the oven and Gualu Roasted Duck roasted over the fire. The famous Quanjude Restaurant mainly serves Gualu Roasted Duck. Generally, people eat it with a pancake and various vegetables. It is popular among ladies and children to eat with sugar. Peking Opera, also called Beijing Opera, is regarded as the quintessence of Chinese culture. The compelling performance includes the magnificent costumes, facial makeup, skilled actions, unique vocals and literary stories. The facial masks are particular interesting, and are painted with different colors to reveal specific characteristics. For example, the red face symbolizes loyalty and straightness while the white face shows treachery and paranoia. Enjoying some major representative work, such as Farewell My Concubine in the Chang'an Grand Theatre, would be an interesting thing to do in Beijing at night. The Beijing Opera House and Mei Lanfang Theatre are also recommended places for enjoying the Opera. Watching a Kungfu show is another interesting thing to do at night. The Legend of Kung Fu at Red Theatre represents the highest level of the Chinese Kungfu performance. Here you can see the marvelous martial art skills as well as the elegant, free and graceful dance. The impressive show will give you an incomparable experience. Hundreds of crisscrossing Hutongs form the old blocks of the city, and are must-see places in Beijing. Hutong is the unique name for the local narrow lanes, which are now flourishing with antique residences, boutique stores, featured souvenir shops, popular restaurants and stylish bars. You can take a leisurely stroll or ride a bicycle here just like the old Beijingers, or take a ride on a rickshaw. Nanluoguxiang is a popular Hutong with lots of local foods and crowded with visitors. Houhai Bar Street is a good place to have a drink. If you happen to travel in December or January, you may want to try one of the most popular things to do in Beijing in winter – skating on the iced lakes in the Shichahai Hutong Area. Panjiayuan is among the best places to visit for antique lovers. The main items found here include jewelry, jade, handicrafts and decorations. The market started in 1992 and is now the most popular antique market in China. Here you can find many interesting handicrafts or decorations. However, if you want to purchase jewelry or some valuable antiques, we recommend you to consult an expert to guard against being deceived. After experiencing all the above, what else should I do in Beijing? Take the extremely modern high speed train and leave the city. China high speed trains have a great reputation because of their advanced technology, safety and high speed. From the Beijing South Station, you can leave for Tianjin, Jinan, Nanjing, Shanghai, etc. From Beijing West Station, one of the largest stations in Asia, you can go here to Zhengzhou, Wuhan, Changsha, Guangzhou. Some of these make great day trips. Is the Beijing Panjiayuan Antique Market better on Saturday or Sunday? Well, both Saturday and Sunday are ok for you to visit this antique market. Most stores will open during weekends. Have fun! Where is the night silk market in Beijing? You can have a try to Xiushui Street in No.8 Xiushui East Street, Chaoyang District.